Actor/writer/director/producer Jake Lipman ’00 founded Tongue in Cheek Theater Productions in 2006. How do women navigate today’s workplace in a world where gender is still an issue, gray areas abound, blatant harassment exists, the glass ceiling has not been completely shattered and, to top it off, you are expected to maintain a healthy work/life balance? 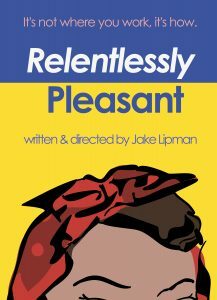 Those were the questions actor/writer/producer Jake Lipman ’00 sought to address with her new play Relentlessly Pleasant. “I wanted to create a play that looked at women in the workplace and saw some hope for our future,” she says. Lipman hopes to use “Relentlessly Pleasant” as a corporate workplace behavior training tool. Relentlessly Pleasant, written and directed by Lipman, takes place on the hectic day before a new, all-female coworking space launches. The office experiences a series of unforeseen conflicts and calamities—everything from a #MeToo incident to various power dynamics among the staff. 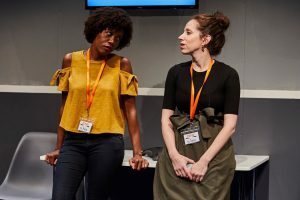 Shauna Pinkett and Jessica DiSalvo in “Relentlessly Pleasant” produced by Tongue in Cheek Theater Productions, in New York City October 2018. 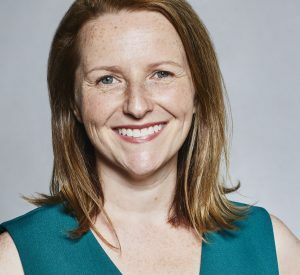 Though its debut run is over, Lipman wants to give small independent theater companies and college theater departments (especially at women’s colleges) the chance to perform Relentlessly Pleasant, and she is adapting it for television. She also sees the play as a teaching tool for corporate America that could be used to start conversations on workplace behavior. Lipman founded TIC in 2006 to produce plays that interested her as a performer. 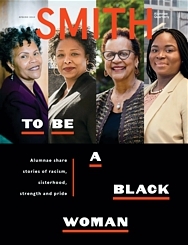 Over 13 years and 40 productions, Lipman’s goal has evolved to writing and producing thought-provoking, topical theater that teaches and entertains—a perfect approach for the former Smith theatre major. In the video above, Jake Lipman ’00 talks more about why she wrote Relentlessly Pleasant.